The push-up bars High Low are extremely stable and are more ergonomically thanks to the oblique handles! 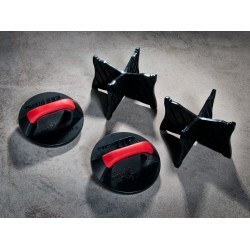 The rotating Taurus push-up grips Push-Up Twister allow a special workout of arm muscles. 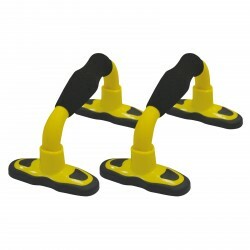 The Taurus push-up grips Push-Up Twister can be used as rotating or fixed push-up grip. 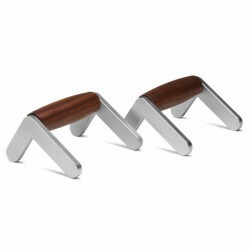 The Taurus ABS Gym Rings are ideal for an effective workout of strength, coordination, and body control. 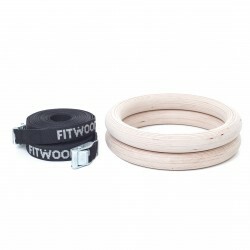 The FitWood gymnastics rings are a versatile and effective fitness equipment. 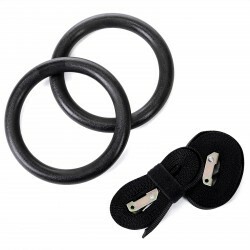 The durable rings are well to grasp and the delivery includes the FitWood Straps, which serve for fixing the gym rings. 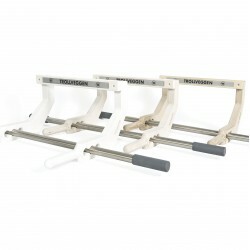 The Trollveggen chin-up bar is a real functional and design highlight. The Finnish manufacturer offers an ideal combination of puristic style and a sturdy structure, for a nice and effectively chin-up training. Scandinavian design - Made in Finland! Top-quality materials — best workmanship — precious design: these are characteristics of teh fitness equipment of Hock. 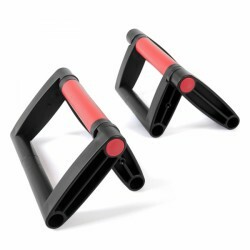 New in line for strength training with style - the Hock PECTOR push-up handles. Create your workout of chest muscles more effectively with foldable push-up handles of Taurus, because you do a much deeper motion. You do not have to stretch your wrist that far with these push-up handles. The Iron Gym push-up handles Push Up Max are great for training of chest and arm muscles. 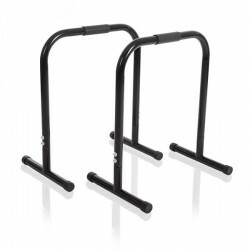 The handles can be used as rotating or fixed push-up handles. The legs aren't completely balanced so they're not equally on the ground all the time, but that just gives me an extra balancing kick. Otherwise it's very sturdy and the handles are comfortable. It's actually quite what I expected. Compared to the Lebert equalizer, I like the black colour much better and its price is unbeatable! Perfect addition to my home gym. Products is very good quality. 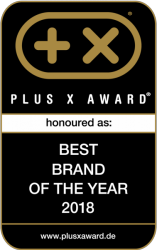 Very good piece of kit and good value . Really am esiinny for home gym. Sokos and multifuctional. Not siitake for very tall but suits for 175 still quite ok.
Dips and push-ups are real classics of strength training. Both exercises originate from bodyweight training and are done with the own bodyweight. Dips and push-ups are also part of the Functional Training, because they train muscles together and support their interplay. Dip units like the Taurus Abs-/ Dip unit for wall mounting can also be used for abdominal muscle training or core training, because exercises like leg lifting or pelvis bending can be done. We offer diverse push-up handles of different versions and manufacturers, which provide stability and safe hold for doing push-up exercises. 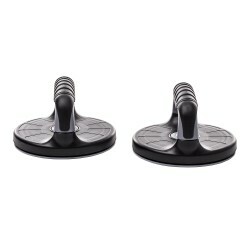 These push-up handles are partially equipped with rotating mechanisms for a more effective training of chest and triceps. Multi-functional trainers like the Lebert Equalizer or the Taurus Multi-Functional Trainer can be used for dips and push-ups and a multitude of other exercises. They offer an almost complete strength training thanks to their varied possibilities of use.